Last year was exciting for us! We welcomed new faces to our team, got to work with inspiring new enterprises and start-ups, extended existing partnerships, and attended several events and insights conferences. We changed our logo, in fact introduced a whole new corporate design, and in October launched an entirely new website. We were able to win 2 awards for our research: The BVM Innovation Prize and the ESOMAR YES Award. We welcomed 15 people to our team, 2 joined in San Mateo and 13 in Berlin. We continued working on highly complex research matters that involved multi-country approaches to a large extent. Overall, we surveyed over 1.13 million people in 152 countries and in 30 languages. And ultimately, the client feedback made us really proud with our NPS at 88. 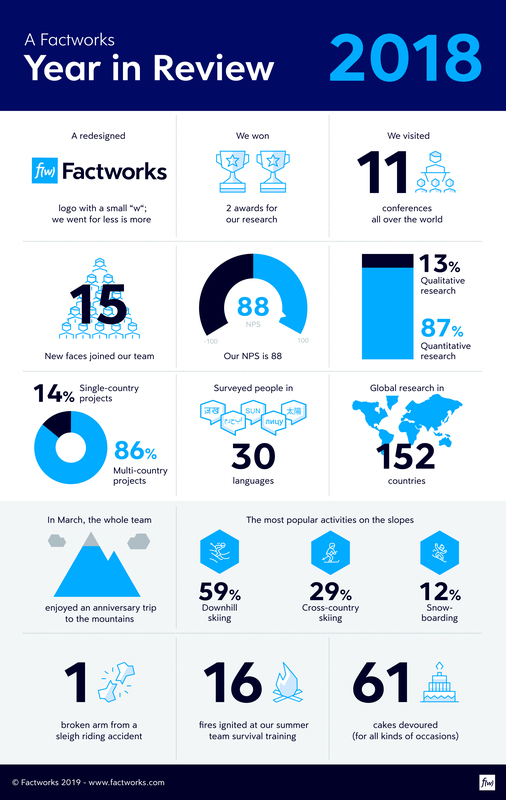 Some of the team highlights were an unforgettable team trip to the snowy mountains of Austria on the occasion of Factworks’ 15th anniversary, a summer event which turned out to be a survival training in the woods and many other occasions to celebrate, eat cake, and have fun.